Intermediate/Advanced Level. 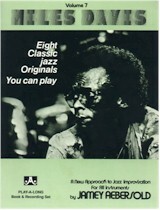 Eight classic jazz originals written by Miles Davis. This is a unique way to learn eight of the most popular songs of the Fifties. These tunes are considered jazz classics because most jazz musicians around the world have learned them. And the reason so many jazz musicians have learned them is because they are all such interesting vehicles for improvising and interesting chord changes, altered bridges and logical melodies that have been quoted in many compositions throughout the music world. Gain an insight into early Miles and gain an understanding of the transitional bop to post-bop period. Related Publication: Vol. 50, "Magic of Miles." Rhythm section is Dan Haerle, piano; Rufus Reid, bass; Jonathan Higgins, drums. Titles: Four, Solar, Tune Up, Dig, Vierd Blues, Milestones (Old), The Theme, Serpent's Tooth.